Quadra Village Day 2012. Celebrating 10 Years! You are here: Home / Arts / Quadra Village Day 2012. Celebrating 10 Years! Who doesn’t love a free, family-friendly, all-ages celebration? Especially when food is involved. You’ll find all that and more at the 10th annual Quadra Village Day, Saturday May 12th from 9:30 am to 1pm. I’ve been actively involved on the planning committee since shortly after moving to the Hillside-Quadra neighbourhood in 2006. It’s wonderful to see people pulling together – businesses, not-for-profits, citizens (young and old), community groups – in celebration. We’re proud to be able to provide an event, open to all, that is completely free – including both pancake and healthy start breakfasts. Start off the day with breakfast, stay for the activities and demonstrations, pull up a seat to listen to wonderful music and watch talented dancers, visit the various community booths, and chat with your neighbours. Rob Rosborough and Ian Welsh, Tremble Aspen, Chris Ho, and Carmanah. The UVic Cuban Salsa Club, The Chinese Seniors Dance Troupe, the Sons of Norway Folk Dancers, and the Vic City Breakers. Don’t miss the Quadra Village Day Dance “flash-mob” at 11am. Quadra Village Day would not be possible without the generous participation and support from our sponsors, and the help of over 100 volunteers. 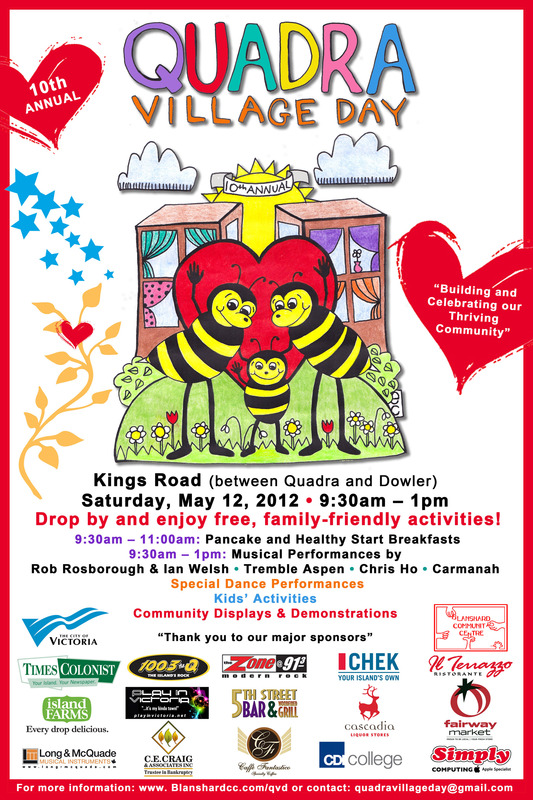 Quadra Village Day Dance needs YOU! Great post! It is going to be an awesome event and the weather is going to be nice. thanks Matt for your help in promoting Quadra Village Day. If you drop by, please come say “hi”.